‘Sea Foam’ can be considered a groundcover, shrub or short climber. 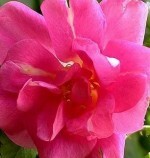 It has white flowers with a pink and perly tinge at the center that fades quickly and an old fashioned form. The long lax stems carry a lot of prickles and small, dark green glossy leaves. One of the most popular climbers, ‘New Dawn’ may also be one of the more vigorous. 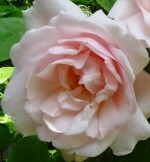 It has long elegant buds that are produced singly or in clusters and open to pale pink flowers with wavy petals. The glossy young foliage is bronze green before turning dark green and the stems are arching and prickly. The plants tolerates poor soil and some shade ,and are a good choice for a tree, wall or trellis.